This instructable will show you how to make your Arduino into an R/C interface that you can use for just about anything requiring remote control. I will also show you how I built an R/C lawnmower using my Arduino, a cheap R/C transmitter and receiver pair, and a couple of electric-wheelchair motors from Ebay. I have used this interface to control anything from basic LED’s to Bipolar stepper motors, mini-robots, lifeless R/C cars from the thrift store, and even a 100lb lawnmower (all with appropriate motor controllers). It is very flexible and easy to change and very simple to set up. See a slightly different version of the Lawnbot400 in my new book “Arduino Robotics” , as well as a DIY Segway and several other bots. New wheel-barrow bucket mounted on top with hinges so it can dump its contents. And new video of the Lawnbot400 moving a bunch of dirt from my truck to the flower beds across the yard, also I updated the code again. I added some new code to the project that is safer, including a manual kill-switch and a Failsafe switch. To implement the Failsafe, I used another Atmega168 (or an Arduino), to control a normally-open 60amp power relay. The relay disconnects the power to the motor-controller unless receiving a “good” signal from the 2nd microcontroller. This signal is updated 2 times every second and is either ON or OFF. If the bot gets out of range, it loses power to the motors. If I flip the kill-switch on the Transmitter, it loses power to the motors. This is also a handy way to disable it remotely if anything were to go near it that wasn’t supposed to. The updated code for both microcontrollers is on the CODE page. In addition to the failsafe, I changed the way the code reads the PPM signals to make it more reliable. Also, I realized that I was only able to run the bot at 80% speed with the old code, so now it is quite a bit faster and has more power (it can carry me across the yard @ 155lb). Check out this new video of me riding the Lawnbot400, my wife driving it over a bunch of branches, then me making do some wheelies. Don’t worry, the mower was turned off this time since the grass didn’t need cutting, we were just having fun. DANGER!!! This is a VERY dangerous piece of equipment if not handled appropriately. Since all the electronics have been home-built and the Arduino code is new, you MUST be very careful while operating anything heavy with this code. I have had 1 or 2 times during testing – and before adding a secondary failsafe – that the main Arduino jammed up and I temporarily lost control of the mower for a few seconds!!!! Though I have added several filters to discard unwanted signals and I rarely have any issues, an un-manned lawnmower IS STILL A POTENTIAL DEATH TRAP and I assume no responsibility for anything that happens as a result of your use of this code or this tutorial. This is meant as a guide for people who not only have the ability to build such a contraption, but the responsibiltity to operate it safely as well. Any suggestions or ideas on how to make this a safer project is always gladly accepted. Having said that, it’s also awesome. Most R/C equipment comes packaged for a single specific use, which makes it easy to use but is very limited in what you can do with it. So using the Arduino as an interpreter between the R/C system and the motor driver, I can use any motor controller that I want (depending on the size of the motor and power required), reprogramming the Arduino to supply the required signals. After successfully hacking a few R/C cars from the thrift store, I got bored driving them around the driveway and I was having a hard time convincing my wife that there was any usefulness in the revived toy car. 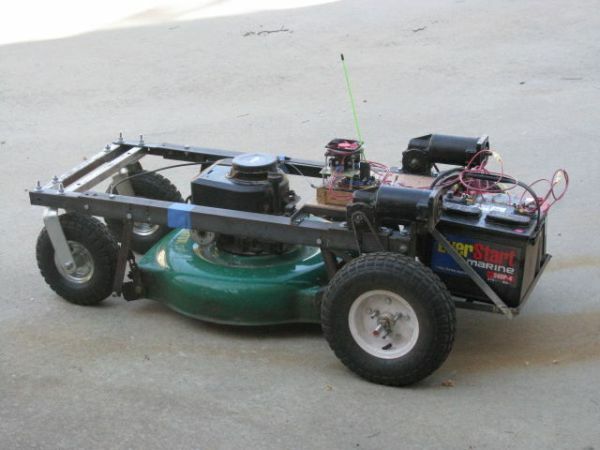 So I decided it was time to make my biggest chore at home, a whole lot easier and actually put my Arduino to work, and thats how I ended up building an R/C lawnmower. While designing the lawnmower, I thought it would be cool to learn about the electronics that made it move, so I designed and built my own motor speed controller (or H-bridge) to power the lawnmower. I looked around at every H-bridge design I could find before deciding to go with a Mosfet h-bridge that uses both N-channel and P-channel Mosfets. 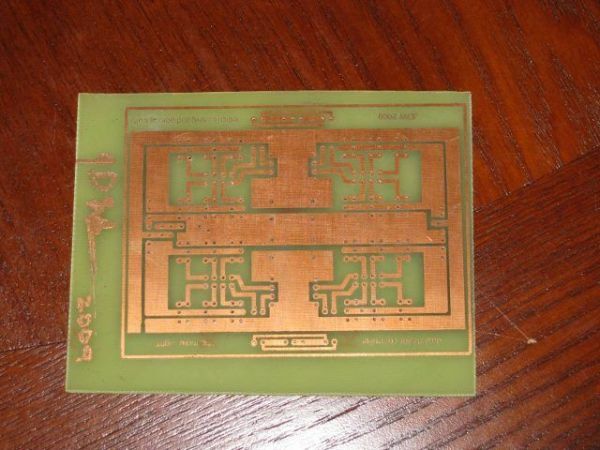 I built several different motor driver boards for this project, the first two were on Radio-Shack perf-board and the next 4 were designed using EagleCad and etched to a piece of copper-clad PCB, using the toner-transfer method. The most recent board is the one I use to mow the lawn as it has the ability to stay cool even while operating for long periods of time (30-40 mins straight) at 10-20amps and 24vdc. FWIW, I had to burn up a lot of Mosfets to find this out. If you want to see any of my other motor controllers, go to www.rediculouslygoodlooking.com and check out the Mosfet shield. You will need an R/C radio transmitter(Tx) and receiver(Rx) pair, which is the most expensive part of the project, but can be used for every future project you might have involving R/C. I went with a 6-channel FM system, but I have tested a 27mHz AM transmitter/receiver and it works just as well. The beauty of the Arduino is that if you want to adjust the deadband or the motor-speed at turn-on, (unlike commercial ESC’s) it is all easy changed in the Arduino IDE. Once you have your radio, all you need to do is upload the code to your Arduino, plug in the 2 channels that you want to use from your radio receiver into Digital pins 2 and 3 of the Arduino (these are the 2 external interrupt pins on the Arduino) and you are ready to control whatever you want. If you don’t have a batter pack for the receiver, you can run jumper wires from the Arduino +5v and GND to the R/C receiever for power, you only need to supply a single channel with GND and +5v (it is not necessary to power every channel). Upload the code using the Aruino IDE (I am using version 0016 on Ubuntu). I started by controlling 3 LED’s with 1 channel on a breadboard. I wired a red LED to be Forward (digital pin 9), a yellow LED for Reverse(digital pin 5), and a green LED for Neutral (digital pin 12). This allows you to adjust the code to fit the needs of your radio system. You will have smooth 0-100% PWM control of both LED’s and the neutral light will turn on when the control stick is centered. If needed, you can widen the deadband for Neutral, but doing so will increase the speed at turn-on (which starts at 0%, so that would likely be desirable). See pictures.